Prime Minister of Guinea Dr. Ibrahima Kassory Fofana has arrived in New Delhi this evening on a 10 day official visit to India. During the visit, Mr Fofona will call on President Ram Nath Kovind at Rashtrapati Bhavan tomorrow. He will also have a meeting with Vice President M Venkaiah Naidu. He will address the inaugural session of 14th CII-EXIM Bank Conclave on India-Africa Partnership Project in New Delhi tomorrow. Nations made the 1st global commitment to reduce the consumption of single-use plastics, including plastic bags, bottles and straws, by 2030. The pledge came after marathon talks at the United Nations Environment Assembly in Kenya. The nations also made other commitments, including reducing food waste and marine litter, as well as developing and sharing innovative technologies. External Affairs Minister Sushma Swaraj is on a 2-day official visit to Maldives. She held a high-level meeting at the Maldives Foreign Ministry at Male. Several ministers, including Foreign Minister Abdulla Shahid, are present at the meeting to discuss bilateral cooperation and development assistance to the Maldives. During the visit, the Minister of External Affairs will call on President of the Maldives Ibrahim Mohamed Solih, the Speaker of Parliament Qasim Ibrahim and meet with several ministers. Both sides will discuss ongoing and future collaboration arrangements. It is expected that discussions will focus on development cooperation, cooperation in the field of health, and enhancing people-to-people contact. 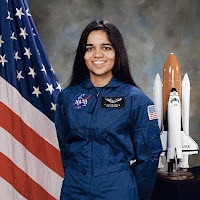 The 1st Indian-origin woman in space, Kalpana Chawla was born on this day (17th March) in the year 1962. Chawla moved to the United States in 1982 and joined NASA in 1988. Describing her first mission in space, she said, "You are just your intelligence", on experiencing weightlessness. The astronaut died with six crew members on her second mission aboard the Columbia spacecraft in 2003. Note : Sunita Williams became the second Indian-origin woman to travel into space in 2006. Former IAS officer Shah Faesal, who became the 1st IAS topper from J&K in 2009, has launched a political party named 'Jammu and Kashmir Peoples' Movement' at a function in Srinagar today. He resigned from the Indian Administrative Service in January to protest killings in Kashmir. The Geographical Indications Registry has granted the Geographical Indication (GI) tag to Coorg Arabica Coffee, Wayanad Robusta Coffee, Chikmagalur Arabica Coffee, Araku Valley Arabica Coffee and Bababudangiris Arabica Coffee. A GI tag is a sign used on products that have a specific geographical origin and possess qualities or a reputation by virtue of their geographical association. The tag conveys an assurance of quality and distinctiveness which is essentially attributable to the geographical origin of the product. The owner of the GI tag has exclusive rights over the product. The NITI Aayog and the United States Agency for International Development (USAID) organized the 1st workshop on development of the India Energy Modelling Forum (IEMF), which has been envisaged as a pan-stakeholder platform for debating ideas, scenario-planning & discussing the India's energy future. The 2-day workshop, being held with the support of the Pacific Northwest National Laboratory (PNNL), was organized under the Sustainable Growth Pillar of the India-U.S. Strategic Energy Partnership. The inaugural session of the workshop was chaired by Dr Rajiv Kumar, Vice-Chairman, NITI Aayog and Mr Mark A. White, Mission Director, USAID India. The National Green Tribunal (NGT), has directed the Central Pollution Control Board (CPCB), to prepare a noise pollution map and remedial action plan to solve the issue across the country. A bench headed by National Green Tribunal Chairperson Justice Adarsh Kumar Goel directed the CPCB to identify noise pollution hotspots and categorise cities with specified hotspots and propose a remedial action plan within three months. The NGT said the absence of implementation of noise pollution norms affects health of citizens, especially infants and senior citizens. Retired Supreme Court Judge Justice Pinaki Chandra Ghose has been recommended to be India's 1st Lokpal (Anti-corruption ombudsman of India). Selection Committee for Lokpal, comprising the Prime Minister Narendra Modi, Chief Justice of India Ranjan Gogoi, Lok Sabha Speaker Sumitra Mahajan and an eminent jurist Mukul Rohatgi finalised Justice Ghose's name in a meeting today. National record holder Irfan KT became the 1st Indian from athletics to qualify for 2020 Tokyo Olympics. Irfan achieved the feat after finishing 4th in the 20-km event of Asian Race Walking Championships in Japan's Nomi. 18-year-old Diksha Dagar became the 2nd Indian to win an event on Ladies European Tour after clinching South African Women's Open in Cape Town. Note : Aditi Ashok was the first Indian to win on the Ladies European Tour after clinching Hero Women's Indian Open in Gurugram in 2016. FIFA President Gianni Infantino today confirmed plans to launch an expanded 24-team Club World Cup in 2021 following a meeting in Miami. The new tournament, which has recently drawn threats of a boycott from leading European football clubs including Manchester United and Barcelona, is to be staged in June-July 2021 instead of the Confederations Cup. India have bagged 70 medals (18 golds, 22 silver and 30 bronze) so far in Special Olympics, which are being held at Abu Dhabi. In Roller Skating, Supreet Singh from Haryana in 1000-meter, Rishabh Jain from New Delhi in 1000-meter and Priya Prakash Gada from Maharashtra in 100-meter won a Gold Medal each. Amanjot Singh won gold in the squat contest after lifting 385kg. Indian roller skaters bagged a staggering 29 medals comprising 9 golds, 13 silver and two bronze. The powerlifters of India also found the podium 23 times by the end of the second day of competitions. The cyclists fetched two yellow metals while the judokas brought in two more gold medals. The athletics and swimming contingents, who are competing in Dubai, were also successful in winning eight medals. The Special Olympics World Games are an international sporting competition for athletes with intellectual disabilities, organized by the IOC-recognised Special Olympics organisation. The Special Olympics World Games 2019 is being hosted by the cities of Abu Dhabi and Dubai in the United Arab Emirates. For the 1st time, the Special Olympics is being held in the Middle East and North Africa region. The host UAE had introduced the term “people of determination” as part of a new National Strategy for Empowering People with Disabilities.